The 10 most dangerous play things of all time - When pigs fly. slow, painful death wrapped in pretty, shiny Xmas wrap! I haven't ever laughed at other people's suffering and misfortunes as I did while reading this article by Paige Ferrari about the top ten most dangerous toys of all time. I actually owned some of these toys when I was a kid, or at least the neighbour's kid did! I remember playing with Lawn Darts and Creepy Crawlers -- but sadly, was never exposed to the "Gilbert U-238 Atomic Energy Lab", which would have been a great "stocking stuffer" for a geeky kid like me! I had the Battlestar Galactica goodies as a kid. Fortunately my parents never took my "bullets" away from me. Now that I think of it, my Dad was probably hoping I would choke on them. I sent mine in and got a crummy matchbox car. I hear yah! We should have swalled faster (giggles)! I think I had the creepy crawlies thang. It really smelled horrible; something about the type of plastic they used. I never actually ate one...I can't imagine why not, though. If memory serves, I recall throwing rubber worms and scorpions in girl's hair with one of my childhood buddies, Michael Rease. No, my dad was so frugal that we only once went to a zoo of any kind, and even that was a stretch. We ate at a Howard Johnson's in New Hampshire on the way back and that was so traumatic that I could spend years just discussing that horrible experience. My dad pinched a penny so tightly that Lincoln screamed for mercy. 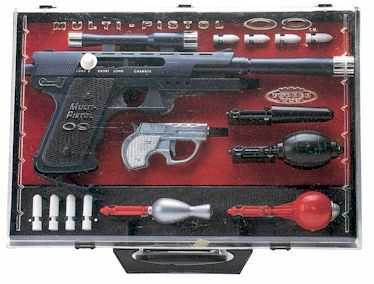 Where is my Multi-Pistol 09..............Canadian James Bond thing. More plastic bullets, etc then Q could have ever imagined. He he he, that toy was "new" in 1965!!! I would have bet you had the atomic energy set! Did your brother have it? Hmmm...definitely the gift for the geek who has a potato clock and crystal radio! Re: That is too funny! Would have my parents punished me for blowing up the town?